For the past 26 years, researchers in the Garwood laboratory have had a focus on developing cutting-edge MRI and MR spectroscopy techniques and on exploiting them in studies of tissue function, metabolism, and microstructure. An emphasis has been on identifying and validating quantitative metrics to assess normal and disease states non-invasively with imaging, and on applying them to learn about metabolism, hemodynamics, and tissue micro-environment. 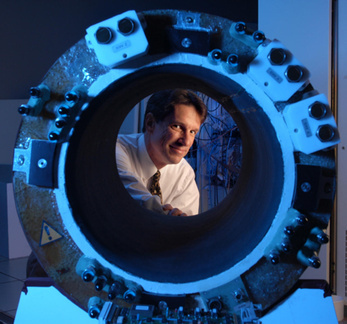 On the technical side, the Garwood group has recently made a significant advancement in the way MRI is performed - a technique called SWIFT. SWIFT exploits time-shared RF excitation and acquisition to preserve signals from water molecules possessing extremely short transverse relaxation times, T2 and T2*. With SWIFT, broadband frequency-swept excitation, together with extremely short acquisition delay, make it possible to also preserve frequency-shifted signals in the vicinity of magnetic objects. For example, magnetically-labeled nanoparticles (e.g., SPIOs), which cause signal voids in conventional MR images, give rise to positive contrast (bright spots) in SWIFT images, thus improving the capability to track and quantify targeted contrast agents and molecular therapies, as well as magnetically-labeled cells. Finally, the Garwood group has a focus on the physics of nuclear magnetic resonance relaxation, in an effort to improve the sensitivity and specificity of MRI for disease characterization, diagnosis, and treatment monitoring. In particular, we are developing ways to “tune” MRI’s specificity to certain dynamic processes in tissues (e.g., assessing the tumbling times and exchange rates of different pools of tissue water) and we are investigating their utility as quantitative markers of neurodegeneration and cancer aggressiveness, and as early indicators of response to treatments. These methods are currently in pre-clinical and clinical trials (lung, breast, and brain cancers; Parkinson’s disease, and multiple sclerosis) in collaboration with other faculty in the University of Minnesota and elsewhere. To apply theoretical formalisms to describe the magnetic resonance phenomenon; in particular, the interaction between nuclear spins and a radiofrequency field having a variable amplitude and frequency in time. To exploit the unique properties of these frequency-modulated RF techniques to enhance sensitivity and data quality in MRI and MRS.
To expose molecular properties of cancers using MRI and MRS, and to use these for making diagnoses and for evaluating and guiding cancer treatments, all non-invasively. Short TE 3D Radial Gradient-Echo MRI Using Concurrent Dephasing and Excitation (CODE). J.-Y. Park, S. Moeller, U. Goerke, E. Auerbach, R. Chamberlain, J. Ellermann, and M. Garwood, Magn. Reson. Med. 67:428-436, 2012. Glioma Cell Density in a Rat Gene Therapy Model Gauged by Water Relaxation Rate Along a Fictitious Magnetic Field. T. Liimatainen, A. Sierra, T. Hanson, D.J. Sorce, S. Ylä-Herttuala, M. Garwood, S. Michaeli, and O. Gröhn, Magn. Reson. Med. 67:269-277, 2012. Functional Magnetic Resonance Imaging Using RASER, U. Goerke, M. Garwood, K. Ugurbil, NeuroImage 54:350-360, 2011. MRI Contrast from Relaxation Along a Fictitious Field (RAFF), T. Liimatainen, D.J. Sorce, R. O’Connell, M. Garwood, and S. Michaeli, Magn. Reson. Med. 64:983–994 2010. SWIFT Detection of SPIO Labeled Stem Cells Grafted in the Myocardium, R. Zhou, D. Idiyatullin, S. Moeller, C. Corum, H. Zhang, H. Qiao, J. Zhong, and M. Garwood, Magn. Reson. Med. 63:1154–1161, 2010. Water Spin Dynamics during Apoptotic Cell Death in Glioma Gene Therapy Probed by T1? and T2?, A. Sierra, S. Michaeli, J.-P. Niskanen, P.K. Valonen, H.I. Gröhn, S. Ylä-Herttuala, M. Garwood, and O.H. Gröhn, Magn. Reson. Med. 59, 1311-1319, 2008. RASER: A New Ultra Fast Magnetic Resonance Imaging Method, R. Chamberlain, J.-Y. Park, C. Corum, E. Yacoub, K. Ugurbil, C.R. Jack, Jr., and M. Garwood, Magn Reson. Med. 58, 794-799, 2007. Assessment of Brain Iron and Neuronal Integrity in Patients with Parkinson’s Disease Using Novel MRI Contrasts, S. Michaeli, G. Oz, D. Sorce, M. Garwood, K. Ugurbil, and P. Tuite, Movement Disorders 22, 334-340, 2007. Fast and Quiet MRI Using a Swept Radiofrequency, D. Idiyatullin, C. Corum, J.-Y. Park, and M. Garwood, J. Magn. Reson. 181, 342-349, 2006. Monitoring Disease Progression in Transgenic Mouse Models of Alzheimer’s Disease with Proton Magnetic Resonance Spectroscopy, M. Marjanska, G.L. Curran, T.M. Wengenack, P.-G. Henry, R.L. Bliss, J.F. Poduslo, C.R. Jack, Jr., K. Ugurbil, and M. Garwood, Proc. Natl. Acad. Sci. USA 102, 11906-11910, 2005. Predicting Response to Neoadjuvant Chemotherapy of Locally Advanced Breast Cancer with In Vivo 1H MRS: A Pilot Study at 4 Tesla, S. Meisamy, P.J. Bolan, E.H. Baker, R.L. Bliss, E. Gulbahce, L.I. Everson, M.T. Nelson, T.H. Emory, T.M. Tuttle, D. Yee, and M. Garwood, Radiology, 233, 424-431, 2004. In Vivo Quantification of Choline Compounds in the Breast with 1H MR Spectroscopy, P.J. Bolan, S. Meisamy, E.H. Baker, J. Lin, T. Emory, M. Nelson, L.I. Everson, D. Yee, M. Garwood, Magn. Reson Med. 50, 1134-1143, 2003.